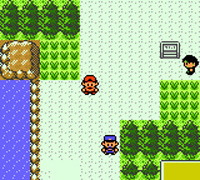 A remake of Pokémon: Gold & Silver Version for the Game Boy Color. Now you can choose between a boy or girl trainer at the start, and there is a new side story about the legendary Pokémon Suicune woven throughout the main game. Pokémon battle sprites are now animated, and you can challenge Pokémon Trainers in the new Battle Building.